From Street Food To Chardonnay, This Weekend Brunch Has Unlimited Options! SET’Z is doing weekend brunch spreads that have cuisines from seven different countries with a whole lot of boozy options to choose from. The pasta counter and the dessert station are not to be missed! SET’Z has always been one of our favourite places to get cocktails in the city, but the place isn’t exactly easy on our wallets. Well, what do you know—they’ve come up with weekend brunch spreads that’ll have you (and us) going back over and over again. Unlike most places in the city, SET’Z is doing a weekend spread on Friday, Saturday and Sunday, as opposed to only on one day. The Friday and Saturday brunch gets you unlimited food from a large, varied spread, as well as two rounds of drinks, and the Sunday spread is even bigger—with a lot more options and unlimited alcohol! 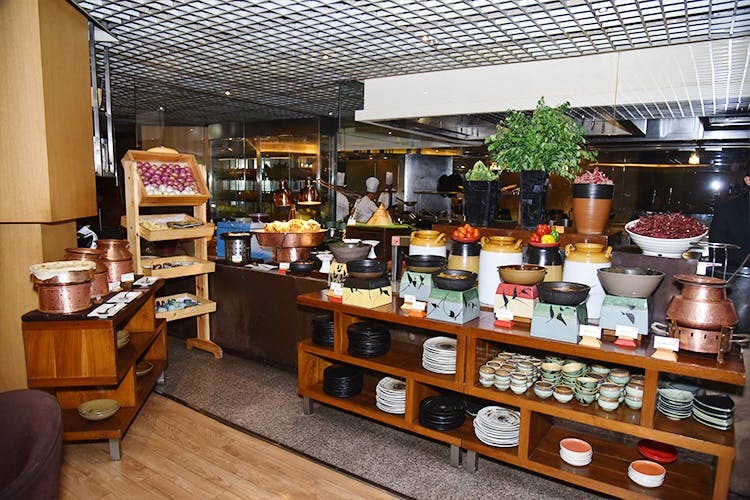 The food options, as we said, are plentiful – soup, salads, dimsum, Indian starters, pasta, pizza, grilled meats, Thai curry, biryani, Chinese options, street food, and a whole lot of dessert – it’s safe to say this isn’t a meal, but a treat. For the booze, you get to choose between Australian or Argentinian red wine, white wine, beer or cocktails made with white spirits – that’s for Saturday. The unlimited alcohol menu for Sunday has options like sparkling wine, red wine, white wine, scotch, vodka, rum, gin, and local as well as imported beer – think Chivas, Chardonnay, Chandon and more. If weekends are for boozy brunches, head over to SET’Z for a feast with the squad. Price: INR 1,950 for Friday and Saturday; INR 3,407 for Sunday (inclusive of taxes). Sushi To Unlimited Cocktails: Bookmark SET’Z For Your Next Sunday Brunch! We Found A Place That Has 101 Flavours Of Iced Tea!